Similar yet different from the rules of the road, there are rules to every boat per State per waterway type. This topic is infinitely long, so I will only briefly cover basic regulations for Florida residents. Boating Accidents: Like the scene of a car accident, if your boat is involved in an accident it is illegal to leave the scene of the accident without giving all possible aid as well as reporting the incident to the proper authorities. Immediately following the incident it must be reported to either the police chief of the municipality, the police force in the country, or the Florida Fish and Wildlife Conversation Commission. Vessel Registration: All vessels except non-motor-powered vessels less than 16 feet must be registered through your local Tax Collector’s office. Your vessel is susceptible to inspection by enforcement officer while being operated, and additionally a Certificate of Registration must be available per their request. Vessel registration must be renewed annually. Make sure to follow the restrictions devised by your local authority for the length and height of registration lettering displayed on your vessel. Speed Restriction: All vessels must operate at minimum speed to maintain steerageway and headway during an “Idle Speed – No Wake” zone. During “Slow Down – Minimum Wake” all operating vessels must be settled in the water fully off plane. 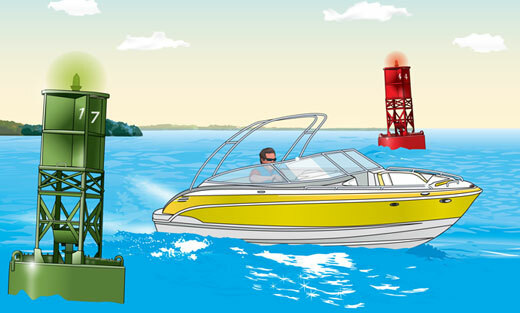 During these restricted areas, wake must not be excessive or create hazard for other boats sharing the waterway. Basic Rules of the Waterway: Roadways typically have clearly evident restrictions and signs, in addition to traffic lights, that help guide motor vehicles to or from a destination. However, waterways do not have as nearly many regulations or signs so it is up to the boaters to drive comprehensively. For instance, when driving towards another vessel head-on both boats should aim to the right and pass on the port side in addition to indicating their intent. Or, if crossing at an intersection the vessel on the left has the right-of-way. If passing a vessel that is going slower than you would like give indication that you are passing such as using a horn blast and pass on the port side. While there are not as many signs, it is important to take heed to any signs you see. Signs will often indicate a potentially dangerous situation. Typically, there are two types of signs that flank you as you drive through a waterway. Odd numbered signs should be to the left at all times while even numbers should stay to the right when entering a channel from a main body of water or upstream. A variety of different signs and marker types can be used to this end. Please identify your state regulated waterway rules for a more concrete, applicable set of restrictions.